Remember that "Our girls go RKS" deviation I submitted onto deviantART back at the end of November 2009? Believe it or not, these were minor concepts for a game idea I had for a fan-entry in the Rosenkreuzstilette series, featuring Spiritia facing twenty different females that originated outside of the Rosenkreuzstilette series, including Disgaea, One Piece, Bleach, Witchblade, Gurren Lagann, and Vocaloid. 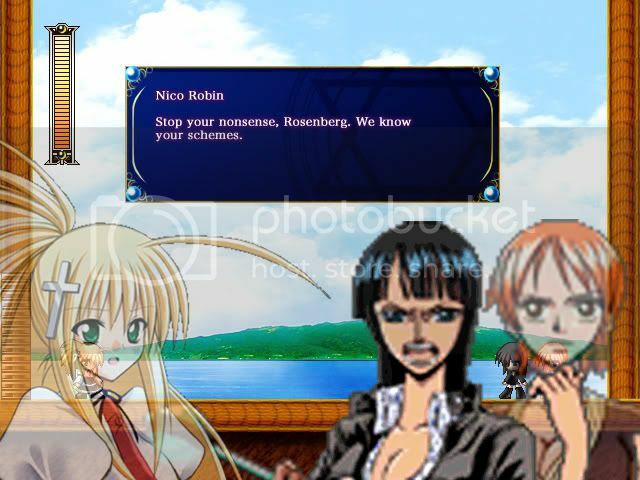 This is not intended to rip-off the RKS series, but instead to act as non-profit tributes to both Rosenkreuzstilette and all the great series that had appeared before December 2007, when the first RKS was released. I'm hoping that this will probably get more RKS fans into the mix, which is the general main idea. Now before you get out your ban-hammers, I should mention what exactly I'm planning to do with this project. For one thing, development has not started yet. All I have are these sprites, and a little mock-up image shown at the end. If I get some good phrase, I may start development once I have the correct tools to do so. Heck, if Exploding-Rabbit can recreate the entire original Super Mario Bros. and insert five non-Mario characters without any problems, I should be able to do the same. If I can't distribute it online as a regular PC game, I'll have to resort to making it in Flash and submitting it to Newgrounds. The game style would be very similar to recent Castlevania games. The entire thing is compressed of one giant stage, featuring many paths and nineteen individual boss rooms like Mega Man. Two of the bosses, Nami and Robin, would be fought together because they both came from the same series (One Piece). After defeating all twenty characters and taking their weapons, A new area that the player cannot leave once entering is unlocked, compressed of the game's "fortress" levels. Once I begin development (if I do, that is), any help will be accepted (sprites, etc.). For now, here's the mock-up I mentioned earlier. The Nami and Robin graphics were ripped by DarkR. Don't want to burst your bubble, no really, I would like to see such an game, but other than exploding rabbit who just remade Super Mario Bros. 1 with 5 different Characters that fit crazy well (though he also just remade the other characters), you (and your team maybe) have to design an big castle that actually works, on your own and 20 (!) different boss patterns. I am not saying that it's impossible but I fear that it will take really long and you will may give up on it early. Well, it took erka:es nearly two years to develop ~Freudenstachel~ and Exploding-Rabbit one year to make SMBC, but with a project this big, it'll take even longer, depending on the team I arrange to participate in programing the game and designing the plot, drawing the official graphics and concept artwork, composing the BGM and SE, testing the game, and everything else. I'm not planning to give up on the project, and take as much time as I can. NOTE: any weapon marked with a * must first be equipped by pressing the attack key, which places the main weapon/object used in order to trigger the weapon in Spiritia's hands. This is an upgrade to Spiritia's main default weapon, enabling the ability to shoot in seven directions, (eight in midair) like in Contra. Along with that, this version also features an additional "charge level" with powerful magenta colored bullets circling in a DNA-spiral pattern, much like in Mega Man X. Obtained from Etna, this generally is an alternative Lustatem with minor homing capabilities and weaker power. Like its predecessor, it can be shot in all eight directions. Obtained from Amitie, this causes a large green Puyo (the blobs) to fall from the sky, which Spiritia can catch and throw at enemies much like Super Arm from the original Mega Man. Like the thrown rocks, the thrown Puyos collapse into four smaller Puyos when they collide with an object. Obtained after defeating Reika Kirishima, this weapon enables the ability to freeze time, like Die geplante Zukunft, except this lasts twice as much, and causes two diamond-shaped sapphires to appear around Spiritia. From there, the player can fire two blue halos at at time, up, down, left, or right. Received from Rukia Kuchiki, this allows Spiritia to throw two red fireballs (affected by gravity) that explode upon contact with anything. Obtained from defeating Nami and Nico Robin, this is Nami's weapon, known to many under different titles. (the Clima-Tact for instance) This allows Spiritia to spin and throw the weapon in a tornado-like fashion, witch will continue to fly at a steady pace until it hits something or reaches the edge of the screen, in which it will fly back to Spiritia (but slightly faster). This weapon is intended to behave much like one of Nami's attacks in One Piece: Unlimited Adventure. The other weapon you receive from Nami and Nico Robin, this is Robin's weapon. Spiritia looks to the ground and moves her arms in a strange fashion, causing multiple limbs to uproot out of the ground. It can be used to kill enemies, and retrieve items. Received after defeating Dizzy. This is a very powerful and wide laser-type attack that can kill anything except the bosses in just one hit. However, it must be charged, or else nothing happens. Unfortunately, the laser also destroys any items, so it may be hard to refill this weapon. Snatched from Misty May, this attack is very simliar to Geisterwand, except it does not have to be charged to make them fly away from Spiritia, and the barrier is made up of hearts instead of maces (that spin much faster!). Yoko's weapon. This puts in Spiritia's hands the powerful sniper rifle that Yoko used in the Gurren Lagann anime. Pressing the attack button causes a single bullet to shoot out the gun and fly at an incredibly fast speed across the screen. On the bad side however, is that there is a small delay before the bullet is shot, and the player must wait a full second before they can shoot again. The weapon obtained from Bunny, which allows Spiritia to shoot knives at enemies. Jumping while holding down the shoot button makes Spirita perform mid-air summersaults and shoot a bunch of knives around her. Masane Amaha's weapon, which functions nearly like Grolla's Grollschwert. Spiritia can perform combos both on the ground and in midair, which can also be done in several different directions, not just straight ahead. (Cooking) Mama's weapon, and possibly the most embarrassing of them all. This gives Spiritia a frying pan with spikes planted on the two sides. Hitting the attack button makes Spiritia perform a melee attack. The good thing is, the mana for this weapon does not deplete unless it hits an enemy. Lenalee Lee's main weapon. This allows Spiritia to perform a series of kicks on the ground, and spin at a rapid speed in the air. When spinning, she can damage enemies. This can also be used to clear certain gaps, as Spiritia's decent speed decreases while spinning. Marina Liteyears' main weapon. This allows Spiritia to extend her limbs to grab and throw enemies and cling onto certain objects, much like the Thunder Claw from Mega Man 8. Shiki Misaki's weapon. Using it calls forth Mr. Mew to fight enemies. While he is helping out, Spiritia can still use Neues Seelegewehr, but is unable to charge it. Eve's weapon. Holding down the attack button makes Spiritia crouch down and shoot out her hair, forming a spike barrier that damages anything that touches it, and reflects projectiles. When used, the weapon's Mana supply depletes very slowly, but drops a little further when an enemy is killed using the shield. Kagura's weapon, which enables a variety of attacks. Spiritia can swing the parasol at enemies to damage them, close the parasol on herself to guard from enemy attacks, and show her decent when falling. Obtained from Sakura Haruno, this allows Spiritia to shoot a wave of five shuriken at enemies, like the Spread Gun from Contra. Anna Kyōyama's weapon. A large laso-type weapon that functions similarly to Simon Belmont's whip from the Castlevania series, but also enables Spiritia to grab and fling enemies with it. Received from Miku Hatsune, this attack makes Spiritia pull out a microphone and shout into it, causing all of the enemies on the screen to, depending on the size, get killed instantly or stunned for a few seconds (while taking a good amount of damage). The Silberflügel series of support items are not shown here. Talk about a very interesting arsenal of weaponry. I sure hope her Rosenkreuzschwert can handle it all. 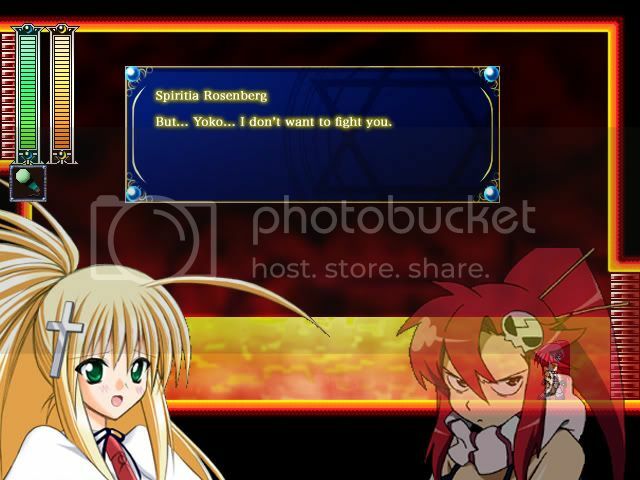 And for the title of this fan-game, does Rosenkreuzstilette ~Übergang!~ (Rosenkreuzstilette ~Crossover!~) sound like an appropate title? Miku's weapon should make Tia throw leeks!!! Anyway, I don't know if this will work. It seems like something you abandon in a few months. I know this from watching others' projects over time. I hate to break it to you Puistink, but the concept of Miku's weapon was already decided. As of now, ~Übergang!~ is nothing more than an general idea, but I'll try my best to keep constant work on this when it enters actual production. I may go on hiatus every once in a while, but I highly doubt I'll actually stop the project entirely. I want to prove to everyone that I can make a game that is just as decent as the original, not to mention I will need a lot of help once I begin the programing and such, and I'm hoping I can round up a decent crew and such to provide assistance. Wait.. SILVER Parsol or Sliver? And as for the Game Name, I would say it sounds awful, nobody calls a Game SUPERAWESOME GAME XY Übergang, here in germany it just sounds wrong. We should stick with Crossover. Sorry for the bad titles. I used SYSTRAN to translate everything into German, and Ubergang was the result for translating Crossover. I also changed the names of the weapons. I have another update. Here's a little showcase of Spiritia's different color alterations for the different weapons. The Sliverwing series are not shown because they are the same as in the games. Unlike the actual games, The color of Spiritia's entire outfit, not just her tie are colored differently based on which weapon she has equipped.